Madigan Shive's cello playing is eerie. Her voice is seductive. The music she creates with her band, Bonfire Madigan, is enchanting. 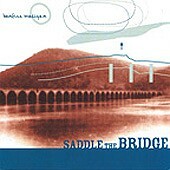 So it goes without saying that their latest, Saddle The Bridge, is an emotional journey through the eerie, the seductive, and the enchanting, without being overbearing or over indulgent. The album's softness coupled with the eerie-ness of the cello will have you listening attentively as you wait for what's around the corner but never quite know if what is around the corner is ever going to show its face or not. I'll give it a B.